With many of the products we buy, there are often times a cushioning inside of the package that protects our precious items. Most of the time, our packages are snugly fit besides the white Styrofoam that we’ve grown to recognize. However, the polystyrene foam that’s found in such packaging has energy usage that has been proven to be harmful to the environment. The plastic based material not only causes negative health effects, but it is a non-biodegradable substance that is one of the leading causes in marine debris . In recent years, there have been efforts made in order to combat the negative impact of Styrofoam. One of the biggest ways of doing this is through using less harmful alternatives. A company by the name of Evocative aims to make packaging products from natural materials while consuming less energy. What they have designed is a fabricated packaging material made from wood, leather, natural fibers, and mushrooms. The main component of this alternative packaging product is the multicellular organism mycelium, from fungi. Ecovative’s mycelium packaging is essentially a self-supporting mixture of natural materials that can be used to replace harmful plastic packaging. Compared with traditional Styrofoam packaging, the low environmental impact of material processes of mycelium production makes it an environmental conscious alternative. One of the ways that Ecovative’s product saves energy is through their approach to acquiring materials. The method of how they grow their mushrooms is straightforward and that uses a small amount of energy in comparison to making polystyrene foams. In order to understand how much energy is consumed in this process, the topic of how it is done must be addressed. 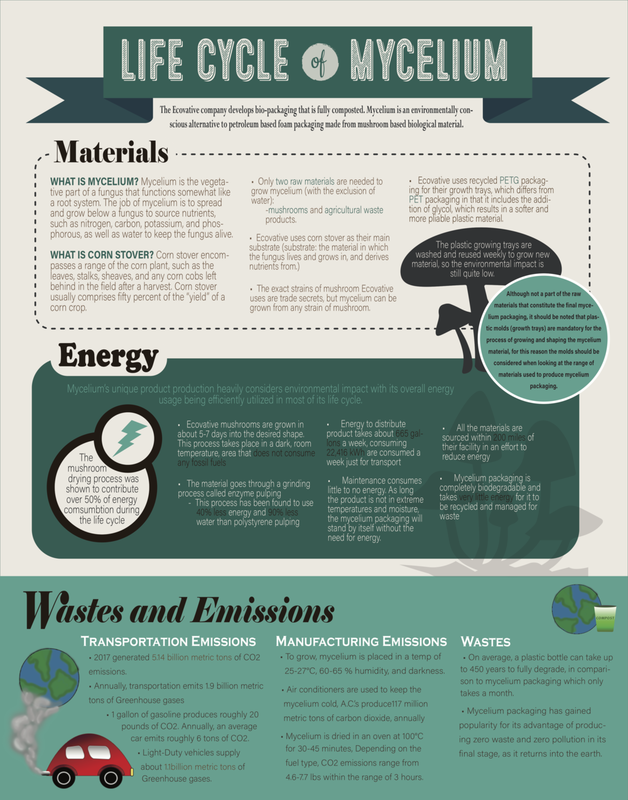 The materials they gather mostly consist of natural byproducts that many facilities already produce as waste. The first step the company takes to acquire their materials is by purchasing the raw byproducts they need through local farms . These materials are then transported to Ecovative’s New York factory to be cleaned and sorted. All the materials are sourced within 200 miles of their facility in an effort to reduce energy usage during the transportation raw materials . This means that Ecovative actively saves energy on transportation. Usually, the byproducts are considered agricultural waste that the farmers no longer have a use for; thus expanding the lifespan and energy usage of these materials. The materials they provide for Evocative include old corn stalks, grape vines, and sawdust. Aside from the agricultural waste, one of the most important parts of their material is their fungi. Mushrooms are grown in about 5-7 days into the desired shape. This process takes place in a dark, room temperature, area that does not consume any fossil fuels . Growing the fungus itself takes very little energy, making the process very efficient so far. On the other hand, Styrofoam is mainly composed of styrene, which is formed from petroleum and natural gas . Both of these materials are known for their high energy extraction methods such as fracking or drilling . The overall energy consumption of material gathering ends up being far less than Styrofoam. Although Ecovative aims to be as environmentally conscious as they can, their manufacturing process consumes a large quantity of energy. In order to produce the Mycelium material, a blending process is put into effect. After retrieving the agricultural waste, it is combined with the mycelium fungal cells where the fibers self-assemble and acts as an adhesive . The process starts with taking all the material and crush it into a more malleable mass, this is a process is known as pulping. Traditional polystyrenes are produced through chemical pulping methods where ingredients such as sulfite, sulfurous acid, and limestone are mixed into a “pulp” . These materials go through a series of digesters, filters, and washes that ends up consuming a large amount of electricity . Ecovative’s packaging, however, goes through enzyme pulping in a more organic process. This process has been found to use 40% less energy and 90% less water than chemical pulping since it utilizes the natural properties of the organic matter . After the pulping process, the fibers are then heated up where they are able to dry and solidify the structure in the fibers. However, research on Ecovative’s drying process has found that it contributes to negative impacts in human health, ecosystem quality, and resources. According to the New York State Pollution Prevention Institute, they claim that “The part drying process was shown to contribute over 50% of the entire life cycle carbon footprint…. As a result, Ecovative is testing an alternate drying process that uses about 1/3 the energy and dries in minutes instead of hours” . Their drying process is the main contributor to energy consumption, thus emitting more carbon into the environment. Although these drying methods end up using a large amount of energy, Ecovative’s enzyme pulping successfully reduces the amount of energy needed to combine materials. When it comes to distributing their products to customers, Ecovative’s energy usage for transportation is not significantly different in comparison to traditional Styrofoam. According to Ecovative’s website, they ship products nationally and internationally from their New York location . For shipping within the United States, they are most likely using mailing systems, such as the United States Postal Service, to ship their products. Often times they are sent through vehicles, such as diesel trucks. On average, a truck driver will usually travel about 2,000 to 3,000 miles per week with an average gas mileage of 4.51 MPG . According to the U.S. Energy Information Administration, 1 U.S. gallon is the same as 33.7kwh. This mean that on average a truck will use about 665 gallons a week, consuming 22,416 kWh are consumed a week just for transport. While there are not very many options to efficiently deliver packages to customers without the use of fossil fuel based vehicles; Ecovative’s distribution tactics are likely to consume the same amount of energy as other cargo. In regard to weight and transport, these natural materials are less dense than their polystyrene counterparts. On average polystyrene can be 0.906 grams per cubic centimeter while corn husks are generally 0.721 grams per cubic centimeter . The difference in density means that there is a slightly reduced energy output for transporting the same amount of material. However, the gap in weight is not very significant, making the amount of energy expended on energy very similar. After the mycelium product is transported to customers, maintenance is very simple. There is little to no energy needed to use and maintain the product. On Ecovative’s website, there are recommendations for general maintenance of their mycelium packaging. The product requires adequate ventilation at room temperature while avoiding excess moisture. As long the product is not in extreme temperatures and moisture, the mycelium packaging will stand by itself . The product can be reused with expending the same low energy maintenance. However, when compared to traditional Styrofoam’s amount of energy to maintain, it is about the same amount. They have very similar qualities, and as long as it is stored in similar conditions, Styrofoam packaging does not need energy to be expended during use . Although there is very little difference with energy consumption during use, Ecovative’s mycelium packaging continues to save massive amounts of energy. Mycelium packaging is completely biodegradable, and takes very little energy for it to be recycled and managed for waste. After use, the product has very simple steps for recycling and waste management. One of the recommended methods of recycling is by breaking the packaging down into smaller pieces and placing them in natural spaces like gardens or composts. In about one month, the mycelium will fully break down and return into the earth . This process, like the maintenance, takes little to no energy to initiate. It also does not create adverse environmental effects such as ozone depletion, endocrine disruption, and global warming . Because of this, the company and consumers do not have to expend any extra energy trying to dispose and manage its waste. In contrast, Styrofoam consumes more energy and is much more harmful to the environment when it comes to recycling and waste management. The polystyrene material can take up to a million years or more to biodegrade back into the earth . There are alternative methods to breaking down Styrofoam such as incineration, which takes up a lot of fossil fuel . When it comes to managing wastes, the mycelium packaging has significantly lower energy consumption. From what Ecovative has released to the public, it is clear to see that they have minimized energy usage throughout their products life time. This alternative packing material is able to surpass the standards of the widely used Styrofoam. Mycelium’s unique product production heavily considers environmental impact with its overall energy usage being efficiently utilized in most of its life cycle. A shift into biological based packaging is a big step we can take to combat the harmful effects of polysynthetic products. Business Insider, 25 Aug. 2016, www.businessinsider.com/ecovative-turns-mushrooms-into-Packaging-ikea-dell-2016-8he-results-are-pretty-cool-18. | Ecovative | Green Island, New York, Ecovative, ecovativedesign.com/mycocomposite?ref=footer. 6. Karabedian, James A., and Maurice W. Blackwelder. "Polystyrene foam sheet manufacture." Reviews on environmental health vol. 28,1 (2013): 1-8. 9. Pollard, Simon, et al. "The circular economy: A reappraisal of the stuff we ‘love’." consumer electronics manufacturers." Product Lifetimes And The Environment(2015). Sections 4.1–4.2. 5." Handbook of pulp (2006): 109-229.
environmental hazards created from its disposal are significantly low. carbon dioxide . Annually, an average car emits roughly six tons of carbon dioxide . emissions produced in the manufacturing process, however, are lower. other companies use hot water and convert it to steam for the process of autoclaving . spanning 7-15 days, the amount needed to allow the mycelium to grow in the darkness [13,14]. (electricity or gas), CO2 emissions range from 4.6-7.7 lbs within the range of 3 hours [13,14]. other companies, especially lower when considering the wastes produced after its final use. stage, as it returns into the earth . mycelium as an alternative material is now considered environmentally friendly and innovative. discarding materials, the materials used for these products are grown and recycled [17,18]. produces low quantities of wastes and emissions. Leaders in Packaging Solutions. N.p., 2018. Web. 06 Dec. 2018. ASCE. "2017 Infrastructure Report Card." Infrastructure Report Card. ASCE, 2017. Web. cells and method of making same." U.S. Patent No. 9,801,345. 31 Oct. 2017. Design Student. Vol. 34. No. 1. 2018. Dellis, Georgios. "Green Packaging." International Hellenic University. N.p., Dec. 2016. Collins. N.p., 23 July 2013. Web. Nov. 2018. Gunther, Marc. The Guardian. ” Can Mushrooms Replace Plastics? , 2013. Guides. N.p., n.d. Web. 03 Dec. 2018. Group. Rhodium Group, LLC, 30 Mar. 2018. Web. 03 Dec. 2018. Services. N.p., 2013. Web. 03 Dec. 2018.
mycelium-based materials." International Journal of Design 12.2 (2018): 119-136. Oct. 2017. Web. 03 Dec. 2018. Noria Corporation. "Manufacturers Waste Millions on Inefficient Lighting." Reliable Plant. Noria Corporation, 01 Aug. 2007. Web. 06 Dec. 2018. Introduction. N.p., 2018. Web. 06 Dec. 2018. Green Building Material." environments 5.06 (2018). U.S. Department of Energy. "Air Conditioning." Department of Energy. N.p., 2018. Web. "U.S. Energy Information Administration - EIA - Independent Statistics and Analysis." Energy - Energy Information Administration. EIA, 2018. Web. 03 Dec. 2018. Mycelium packaging, a new mushroom based material that has become popular in recent years, may become one of the next great sustainable and renewable materials of the future. From start to finish, the materials, energy, and waste plan of Ecovative packaging is a model for true cradle to cradle and low impact design. By using mostly natural materials, reusing waste products, and harnessing the power of biology, Ecovative packaging manages to shrink its’ footprint to only what is necessary. Through a thorough analysis of the life cycle of the compounds that make up the packaging itself, it becomes clear that mycelium based packaging is not only environmentally friendly in its’ raw materials and production processes, but even in its’ final state as a waste material. Ecovative packaging exceeds expectations for how to sustainably produce and manufacture large scale, commercial packaging. Ecovative Design, a company composed of a diverse group of engineers, biologists, artists, and designers, takes pride in their green business practices, which can be clearly seen in their products and manufacturing processes. The company is Cradle to Cradle certified, a design certification that garners tremendous respect and holds a high level of importance in the design industry. Cradle to Cradle certification evaluates material health, material reutilization, renewable energy, carbon management, water stewardship and social fairness, which provides a broad range for overseeing and appraising companies. Ecovative Design is committed to working from the industrial scale down to the individual household to reduce the use of unsustainable and toxic materials, with an emphasis on packaging and building materials. The material science company develops bio-packaging that meets the need for sustainable products for the modern world. They do this through the use of mycelium, a high-performance, mushroom based biological compound. The raw materials sourced for Ecovative’s mycelium packaging are remarkably simple as well as environmentally friendly. Since the mushroom packaging is created from a biological material, mycelium, the process of creating the packaging differs greatly from most standard processes of manufacturing. In order for mycelium to grow, it must be combined with a substrate, in which the mycelium can live, feed, and grow (Renwick). Mycelium based products are the new environmentally conscious alternative to petroleum based products such as insulation, foam packaging, and many more synthetic materials (Broom). Mycelium can be used to create products, ranging from foams, molded packaging, large building blocks, panels, and textiles, and unlike the conventional, synthetic alternatives, mycelium based products are fully biodegradable and easily compostable. Ecovative products are grown in factories and then “frozen” in time when the growth becomes the finished product. The energy needed to for this growth is almost nonexistent as the mycelium material only needs a dark environment and nutrients to grow. Mycelium, one of few raw materials used in the production of Ecovative packaging, makes up the majority of the finished mushroom based packaging that is produced by Ecovative. Mycelium is the vegetative part of a fungus that functions somewhat like a root system. The job of mycelium is to spread and grow below a fungus to source nutrients, such as nitrogen, carbon, potassium, and phosphorous, as well as water to keep the fungus alive (Stamets). Mycelium extend the area in which a fungi can find nutrients by spreading out in the soil in a branch-like pattern. Although in nature mycelium and the visible fungus spores usually referred to as “mushrooms” go hand in hand this is not the case in many factories producing mycelium, including Ecovative. Ecovative intentionally suppresses, or keeps dormant the spores that would usually grow alongside mycelium, so that only the root structure is able to grow. What is so unique about the use of mycelium as a raw material, is that it is not so much sourced, extracted, or synthesized like many other raw materials, but grown instead. This makes for a very low energy and low waste raw material. The exact strains of mushroom that Ecovative uses for their mycelium are of course trade secrets, but mycelium can be grown from any and all mushrooms to produce roughly the same effect. Almost as important as the mycelium itself is the substrate in which it must be grown in, a mixture of agricultural material, and water. Of the few raw materials used in the production of Ecovative packaging, the company once again puts sustainability first, using agricultural byproducts and waste products as their growth medium for the mycelium. Ecovative’s website states that they mainly use “chopped up corn stalks and husks, from regional farmers”. This corn waste product is commonly referred to as Corn Stover. Corn stover encompasses a range of the corn plant, such as the leaves, stalks, sheaves, and any corn cobs left behind in the field after a harvest. Corn stover usually comprises fifty percent of the “yield” of a corn crop, so the ability to make use of such a large amount of leftover waste is another reason (Daud). By using corn stover as a raw material, Ecovative works to reduce its’ material waste footprint, as well as reuse materials that would in most circumstances be discarded as waste. In many cases, farmers will burn the leftover corn stover that is left behind in the field. By repurposing this waste material, Ecovative is also reducing the amount of smoke and air pollution that would otherwise go into the environment. Once the corn stover is brought to the Ecovative factory, the agricultural waste is steam cleaned, ensuring its’ sterilization before being introduced to the mycelium. This step prevents mold or contamination in the final packaging product. With corn being a biological material, the process of “extraction” or “refinement” needed to obtain it is essentially non-existent. And since Ecovative only uses left over waste, and does not grow corn specifically for use in their product, the water, fertilizer, and energy put into the growth of the corn cannot fairly be counted towards Ecovative’s end product. This agricultural waste (corn stover) serves as the “building blocks” of the finished product. The biological material also serves a role as “food” for the mycelium (the Factory is the organism). The biological material is slightly dampened and then combined with the mycelium to start the growth process. Once the roots (mycelium) begin to grow in the substrate, they act as the binding agent, that will eventually hold the finished product together. (factory as an organism). Compared to conventional packaging products such as polystyrene, where petroleum is used to bind materials together (with much greater environmental consequences), the binding and construction of the mycelium packaging is all biologically based, which creates much less waste and uses substantially smaller amounts of energy. (factory as an organism). In this way, the conventional “factory of production” is more akin to an organism. Of the very limited raw biological materials used to create Ecovative mycelium packaging, it seems important to include one vital piece that, although not a part of the final project per se, is fundamentally necessary for the production of the mycelium packaging, the plastic growth trays used to form and shape the final product. There is one crucial part of Ecovative mushroom packaging, that is not actually a part of the final product at all, but without it, the packaging would be unable to grow, and for this reason it will be included in the materials overview. This fundamental element in the production of the mushroom packaging are the plastic molds used to grow the mycelium in. The trays are Ecovative use are made of PETG plastic. PETG plastic is similar in chemical structure to PET plastic, or polyethylene terephthalate. The main difference between the two is the addition of glycol. This one addition completely changes the properties of the material. Unlike PET plastic which is brittle and becomes hazy when heated. The addition of glycol to the plastic produces a “softer and more pliable material” with a higher degree of shock resistance (Petrosh). One of the downsides to PETG plastic is that it is unable to be autoclaved, an important tool for sterilization, but this is remedied by sanitizing the plastic with steam. Ecovative uses recycled plastic to create their PETG growth trays which is in line with their sustainable company values. The PETG trays are also washed and reused indefinitely for new mushroom packaging, which again adds to Ecovative efforts towards sustainability. Ecovative mushroom packaging is a truly low impact product. The company goes to great lengths to ensure that all steps in their manufacturing process, from materials acquisition, to growth, to the final packaging product, produce as little waste as possible, re-using materials when possible, and creating a final product that can return to the earth as easily as it came from it. Ecovative stands out as an industry leader, demonstrating that quality, multi-purpose products, can be created through environmentally conscious and sustainable ways. Ecovative works to produce a packaging material to serve the needs of today as well as to innovate for the future, all with quality and reliability in mind. Broom, Dorothy. “Peak Plastic: The Proliferation of Plastic.” ReNew: Technology for a Sustainable Future, no. 133, 2015, pp. 62–66. JSTOR, JSTOR, www.jstor.org/stable/renetechsustfutu.133.62. Daud, Zawawi, et al. “Exploring of Agro Waste (Pineapple Leaf, Corn Stalk, and Napier Grass) by Chemical Composition and Morphological Study.” Journal of Textile and Apparel, Technology and Management, BioResources, 2014, ojs.cnr.ncsu.edu/index.php/BioRes/article/view/BioRes_09_1_872_Daud_Agro_Waste. Petrosh, Christopher. “PET vs. PETG: What Is the Difference?” Duran Wheaton Kimble, Wheaton, 22 June 2016, blog.wheaton.com/pet-vs-petg-what-is-the-difference/. Renwick, Dustin. “Materials Science 101: Molding Mushrooms.” EPA, Environmental Protection Agency, 12 June 2013, blog.epa.gov/2013/06/12/materials-science-101-molding-mushrooms/. Stamets, Paul. Mycelium Running: How Mushrooms Can Help Save the World. Ten Speed Press, 2005.